Complete outfitting includes your choice of canoe style, generous food supplies, and all camping equipment. 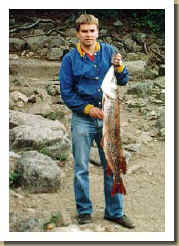 All you need to bring is fishing gear and personal items. 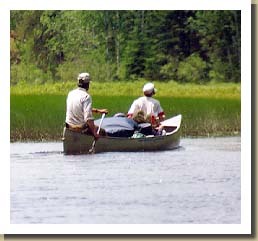 Canoe brands include Grumman, Alumacraft, Souris River, and Wenonah Kevlar. In addition to tandem canoes we stock 3-seat models as well as solo canoes that weigh just 36 pounds. Our food is packed according to the meals you select off the menu. The first two dinners are fresh and then tasty freeze-dried entrees after that. A vegetarian menu is also available. Partial Outfitting: Any item that we offer with the complete outfitting may be rented individually on a per day basis. Group Rates: Reduced rates are available for scouts, church youth groups, and other non-profit organizations. Call or e-mail us for a Trip Planning Kit. RESERVATIONS – A $75 per person deposit is required on complete outfitting or food package. A $150 deposit for the entire party is sufficient to reserve partial outfitting. Your trip may start any day of the week. Calendar days apply, no part days allowed unless cleared in advance. We always have enough equipment on hand. It’s the entry permits that are limited, so please MAKE YOUR RESERVATIONS EARLY! SALES & LODGING TAX – Outfitting is subject to 7.375% Sales Tax. Sales Tax and a 3% Lodging Tax applies to motel accommodations. CANCELLATIONS – Trips cancelled at least 15 days in advance receive deposit back less a $25 processing fee. No refund available with less than 15 day notice. EARLY RETURNS – If you return from your trip early, we’ll refund for the days of early return on equipment only; no refund on food. PAYMENT POLICY – We accept cash, personal checks, Visa, MasterCard & Discover.